If you’ve ever wanted to get to the root of your procrastination issues then you’re reading the right article. That’s because you’re about to discover that FEAR is one of the major contributors to procrastinating. And the good news there are 3 types of fear that once identified will help you discover how to eliminate the procrastinating behavior. Many woman who find themselves procrastinating because they have to face a lot of new decisions during a time of transition in their lives. Maybe the kids are now off to college. Maybe they are facing a sick loved one or the death of a loved one. And for women who have spent most of their lives serving others, it’s often very difficult to look at what life might be like when faced with choosing a new direction. Their minds are filled with questions like? How did my life end up this way? Entering into a strange and uncomfortable place with the thought of failing is a heavy bag to carry. Here’s how this thought might have been put in your head. Was there shaming conversation told to you by your parents or teachers before an important test or event at school? Maybe you tried out for the cheerleader and didn’t make the team. Were you praised for the “try” or for the “not making it” on the team. So, the first thing you need to do is realize that the idea and the shame of not meeting other’s exceptations was not your fault. You were crippled a bit by parents or teachers through imprinting the very thought that you might not success. Without eliminating those old patterns of belief, you approach new things with fear of the shame of failing. What would people think of me? How embarrassing to see those faces of anger or disapproval again, in our inner minds. We would do all the shaming from the inside game we learned. When this was first suggested to me, I simply couldn’t agree. No, I wanted to succeed. Success means less personal time. I want you to look at the the thought of reaching your potential another way. What if you got to do what you loved to do all day? Remember how you can get lost in doing something that gives you pleasure. If you love to garden, I bet you loose yourself while putting your hands in that dirt. Right? I know I can loose myself in preparing for a dinner party. I love the presentation and production of having a dinner party. Do you know what I mean? What gives you that feeling? When overcoming each of these fears, it always starts with recognizing why you are procreating. Is it one of these fears? If it is one of these fears, revisit where you first experienced it. Think about the event. Was the event important to you or to the adult around you? Did you complete the event? Was there any joy in doing the event? What do you know today that you did not know at the time you first did it? Choose if you, the adult, want to do this event. What is the reward of doing it. Today is the day to stop the fear and reap the rewards. 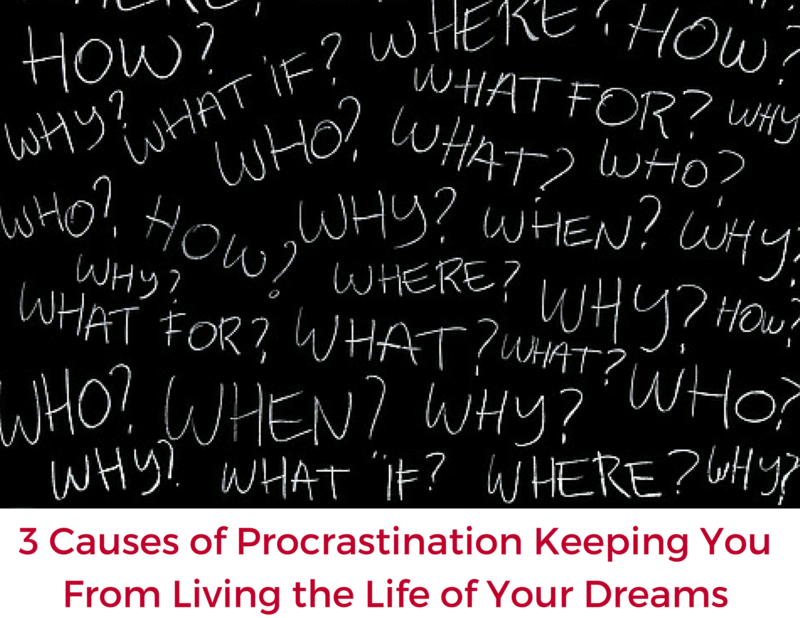 Procrastination stops us from reaching for your DREAMS and the joy and fulfillment that is waiting for you to claim. I’d love to hear what you dare to dream of doing! Please leave a comment below.